Now that I'm in the throws of exploring my new neighborhood, I'm on the hunt for deals. While walking on NE Alberta street, which is also dubbed the Arts District, I've been noticing a myriad of Mexican restaurants. I can't complain about the abundance of Mexican food in Portland in general and always welcome a solid, inexpensive option to get my tacos, burritos, rice and beans, and now tamales. Loving the size of the tamales, they're neither large or small, but really just right. Taking a mere minute and a half to warm up, be careful as you unwrap the corn filling from its corn husk. 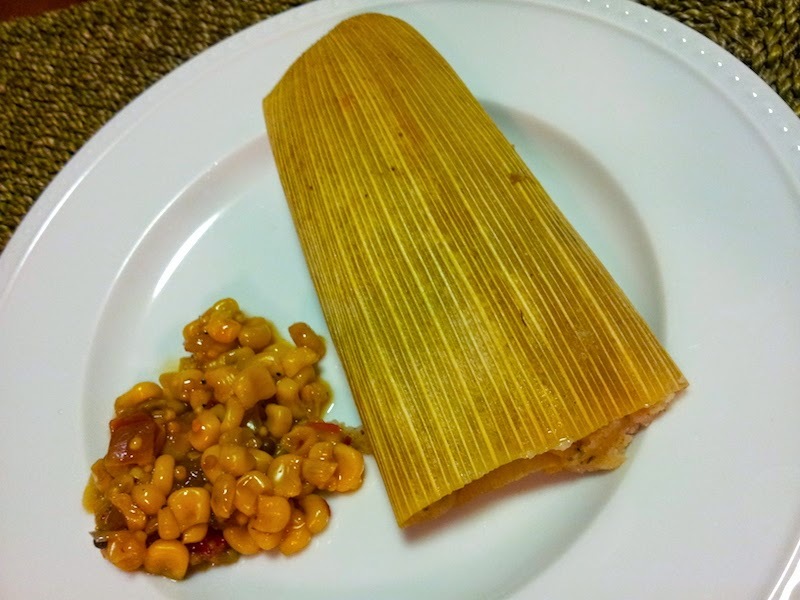 Once you do, be prepared to indulge in a hot, comforting corn filling laced with chunky pieces of pork or chicken in the middle. Cooked in a slightly smoky red sauce, these babies definitely don't lack flavor or spice. I further enhanced them with Trader Joe's corn salsa that you see above, and it definitely did the trick.